arrow_backPrevious Nextarrow_forward Discovering Mythical Japan Tour 2019-LAST 5 SPOTS! “Discovering Mythical Japan” is an exploration into traditional and ultramodern Japan. Come, join, immerse yourself in Japan’s unique land, art, and culture all while enjoying the beauty of the stunning fiery blends of yellow, orange, and red foliage. 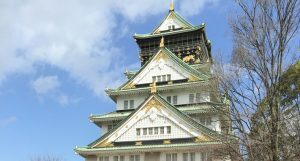 This unforgettable ten-day escorted tour begins in Osaka, Japan’s third-largest city, a place where things have always moved a bit faster. Above all, Osaka is a city that loves to eat: its unofficial slogan is kuidaore (‘eat until you drop’). Then, Nara, with its awe-inspiring Great Buddha at Todaiji Temple and Tamatsukuri Onsen, one of the oldest onsen in Japan, dating back to 733AD when apparently the Shinto Gods themselves bathed in these waters. Antiquity doesn’t end here as we will also be visiting Izumo Grand Shrine, one of the most ancient, already in existence in the early 700’s, Tottori Dunes, Japan’s largest sand dunes, Mt. Shosya’s Enkyoki Temple where scenes from the movie, The Last Samurai was filmed, and elegant Himeji Castle, an original, built in the beginning of the 17th century. There’s a free shopping day in Osaka as well an afternoon to explore Himeji’s Miyukidori Shopping Arcade, two sake brewery visits, the Adachi Museum of Art and its incredibly beautiful Japanese garden. This is a fall foliage tour you won’t want to miss! In flight meals, breakfast daily at your hotel, 3 lunches & 1 dinner. English speaking guide and Panda Travel ® respresentative throughout your journey. Final payment due by August 12th, 2019. Package is non-refundable after this date. 11/16/19 – Depart Honolulu on Delta Air Lines flight 277 at 12:35 pm and arrives in Kansai at 6:00 pm, 11/17. 11/25/19 – Depart Kansai on Delta Air Lines flight 278 at 9:00 pm and arrives in Honolulu at 9:20 am (same day).